A perfect mix of warmth, wit and a little eccentricity. The August Winner of the ‘Share a Post or Send in a Review’ contest is a Macpherson! Thank you Karen for your lovely words. Your complimentary copy of Bloodlines-Traces is on its way. Review of Karen Macpherson on Bloodlines-Touch Not the Cat. Will you be the September 2016 Winner of the Share a Blog or Send in a Review contest? 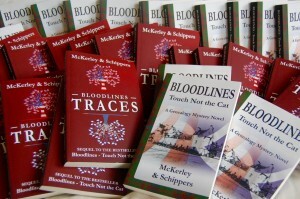 Win a copy of Bloodlines-Traces or Bloodlines-Touch Not the Cat, to be send to an address of your choice, in Europe, U.S.A or Australia/New Zealand. Every month a lucky winner’s name is drawn from among the e-mails.